T​his 3 story house at 960 Main Street has been divided into 3 separate condos. The lower "Garden View"condo sleeps 8 guests. The upper "Eagles Nest " condo Sleeps 6 guests. "Buck's Hacienda" is the owner"s deluxe walk-out basement condo and it sleeps 2 adult guests and 1 child. Each condo is newly decorated with a Colorado mountain theme. This centrally located home is one block from the Ouray Hot Springs Pool and Spa, and it is only 5 blocks to the center of Ouray. You can rent one or all three condos based on your needs! Special discounts if renting 2 or more condos ...quotes by request . Thanks for your interest! BUCK'S HACIENDA: I have recently added a 3rd walk-out basement DELUXE condo to my holdings. It has been added as a new VRBO rental property, BUCK'S HACIENDA. I built it primarily for me the owner! Rustic Colorado interior with all stained pine interior walls. All LED light fixtures, and very well decorated by the owner. Because it is a basement dwelling in a very old Ouray house, ceiling height is limited to 6 FT 10". and door openings are 6 feet... BEDROOM: is a very nice oversized bedroom with a queen bed, and a large triple recliner sofa. BATHROOM: average size with a shower, toilet and vanity. SHOWER CEILING 72". KITCHEN: very compact and is fully functional, although there is no dishwasher. Whiskey barrel dining table seats 4. Plenty of storage, granite counter tops , double oven and large double sided refrigerator. There is a private ground level patio with stainless propane grill, and a large grassy area , and incredible 360 degree views of the mountains. Two night minimum plus taxes, refundable damage deposit, plus cleaning fee. The following is in UPPER CASE only to clarify, and to help you understand pricing for each condo ....Please its not meant to offend. Thank you! THE UPPER LEVEL:"EAGLE'S NEST" CONDO IS NOW IS ON VRBO AS A SEPARATE LISTING PER VRBO REQUIREMENTS. THE NIGHTLY RATE IS POSTED WITH THE LISTING. Rent both for 4 or more nights and get a 10% discount. There has been some confusion regarding pricing for both condos together. Please feel free to call for further clarification. Thank you! Both condos are very nice and are priced seasonally based on value and demand. My house keeper is the best in the area. Faultless credentials. You will be very pleased with both the Colorado western theme and the 4 star appearance and cleaning. Quotes for one or both condos are generally sent to your email within 24 hours. Endorsed by Ouray Visitor Center and Chanber as having multiple 5 star referral ratings. THE UPPER CONDO: Maximum 6 Adult guests. The upper condo has a completer kitchen, a small living area, and sleeps six comfortably. It has one bath, a queen in the master bedroom, and 2 queens in a very large bedroom on the 3rd floor. There is also a futon in the living room. This condo has an upper deck patio with a gas grill. and oversees the mountains to the east and west. Limited to 3 couples, extra charge for more guests. The LOWER CONDO: Maximum 8 adult guests. The lower condo is much larger, and is recently renovated. It has queen bed master bedroom, full size bunks in second bedroom , a queen sleeper sofa, and 2 complete bathrooms. The new 2nd bath has tile floor, oversized tile shower and full vanity with extra storage. There is also a 3rd small bedroom with a double bed. There is also a large ground floor patio. VRBO quotes are for this condo only. Limited to 4 couples, extra charge for more guests. Both have gas grills and complete kitchens and laundry facilities. PLEASE NOTE that availability per the VRBO calendar may not be accurate Please email Gary to verify availability. Visit our website. This restored Victorian home is conveniently located on Main Street in the town of Ouray Colorado, often referred to as 'Switzerland of America', and contains 3 condos. A scenic park is adjacent to the property, with incredible views of the surrounding mountains and rock cliffs. The upper condo has fully equipped kitchen, a living room, one bedroom with a queen bed and a very large bedroom upstairs with two queen beds, separated by a half wall and the stairway, and a very spacious large bathroom. Washer and dryer Nicely decorated with all amenities. There are great views from the deck and every window. View wildlife without leaving this comfortable home away from home. Outdoor propane grill is available on the deck. WIFI and Direct TV are included. The lower condo has a large fully equipped kitchen, dining room, living room, 2 bedrooms, queen in the master, and full bunk beds in second bedroom. There is a queen sleeper sofa and reclining love seat in the living room. There are 2 bathrooms, first contains a claw tub/shower, nicely decorated, and a new second bathroom with large tile shower, and very nicely decorated. It has all amenities , with washer and dryer, and a great patio. There is a outdoor propane grill on the patio.
. Enjoy all Ouray offers from a scenic downtown location! Perfectly located on Main street and less than 3 blocks from downtown and the Hot Springs and Spa. This area offers the best of all outdoor activities, mountain scenery at its best, by jeep, or hiking trails. Close to Telluride and Silverton. I'm a semi-retired veterinary surgeon. I've been a practicing veterinarian for over 42 years with a special focus on small animal orthopedic surgery. I now do limited referral surgery for veterinary practices in Kansas, Texas, New Mexico, and soon again in Colorado. I grew up on a small Wyoming ranch where our family actively did it all, from fixing fence to feeding the cattle during the winter, and of course watching the antelope play. My dad was avid donor to the All-Around Cowboy at Cheyenne Frontier Days Rodeo, giving the Champion Cowboy a new fancy two horse trailer for several years, and also supported with donations promotion efforts for the USA's largest rodeo.. We raised and showed horses in the Rocky Mountain area. It was a great way to grow up. I've always loved the Colorado mountains, and with friends discovered Durango, Silverton, Ouray, and Telluride, Colorado years ago on Motorcycle trips on the"Million Dollar Highway." It soon became an annual venture to explore the mountain scenery. Once I discovered the fabulous Jeep trails around Ouray,, I was addicted. However after survivng a solo ATV rollover, i realized this is no country for the weak hearted.. It can be dangerous. The high mountain scenery will leave you breathless.....Bring your camera, and clothing for all seasons. I've seen incredible thunderstorms creep up your backside and make you tremble as you seek shelter worth the experience! I purchased a historical 3 story Ouray home in September 2014, and remodeled the home. It now is a 3 bed upper condo, and a 4 bed lower condo, and thirdly, my own private Man Cave that I call Buck's Hacienda. All three are available for guests to rent. My house is 1 city block south of the Ouray Hot Springs Pool and Spa. My many guests over the past few years have become personal friends, as we've shared our adventure stories on the patio. Welcome! The views from this house are amazing. Whether you pick the upstairs unit or the downstairs, they both have very unique qualities. 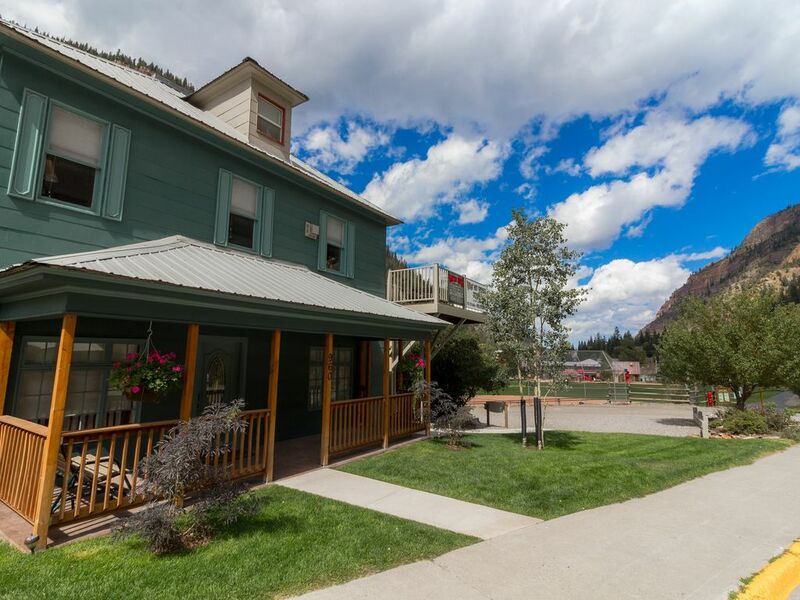 It's an easy walk to downtown, and only 1 block to the Ouray Hot Springs and Spa, 3 blocks west to the river walk Perfectly located on the edge of town for easy access to shop or start outdoor adventures. Ample parking for recreational vehicles. I fell in love with this house partly because of the location and partly for it's history. THIS HOME IS A HISTORICAL LANDMARK. The original owners settled here in around 1890, built there small home here, at what later became 10th and Main They were very involved in the community. Their descendants leased the adjacent property that became the historic ballpark to Ouray for $1.00 for a 100 year lease in 1917. The downstairs unit has a swing in the front so I can look at the mountains. The views are amazing . The deer love to look inside as they eat our flowers. Often times we can watch the deer from our kitchen window grazing in the park This is just a great location! toilet, shower, Large and spacious with lots of storage! Upstairs Condo has a large bathroom with plenty of storage. Tiled floor with shower bathtub combo. Downstairs Condo has two complete bathrooms. First has a shower tub combo with a claw foot tub..Second is new, with large tiled shower and very nicely decorated . Great view from every window. "LITTLE SWITZERLAND"
Lower Condo has a great living room area. Upper Condo has beautiful wood floors and 10 foot ceiling. We provide coffee for our guests. Upper Condo 2nd story All amenities. Table seats four as well as an island to seat 3 more. Lower Condo ground level. All amenities. Dining room table seats up to eight people. Downstairs might work as there are no stairs, but the bathroom is not large enough for a wheel chair. Please note nightly prices quoted are for *UPPER CONDO. LOWER CONDO with new second bathroom rents for additional $30.00 per night. Substantial savings for groups renting both condos for identical dates: 15% DISCOUNT BOTH CONDOS, IF RENTING 4 0R MORE NIGHTS, AND CLEANING FEES ARE WAIVED EXCEPT JULY 4 WEEKEND. Right in the heart of Ouray, walked to everything, closest house to the town pool/hot tub complex, really nicely appointed kitchen, plan to cook! The house was very comfortable and conveniently located. It was also very well stocked and felt like home. We would definitely recommend this as a great place to stay for a visit in Ouray! The accommodations were clean and had all the amenities needed to cook, wash and feel at home. The location was great, close to town and the hot springs pool. Also the park was next door with a walking trail and playground. We enjoyed hiking, jeeping, swimming and being able to come back to a home away from home. Hope to go back soon. The condo was wonderful for our group of three adults and three teens. Very well furnished kitchen (I had to do some cooking for a wedding); beds are very comfy. The lighting in the front bedroom was not great, especially for reading in bed. Nothing a couple of clip on lamps or stick on tap lights couldn't fix :) I'd be happy to rent from Gary again. The property is clean and well kept, ample space for our group. Fantastic location! Perrhaps the best in Ouray!!! The owner, Gary, is the best!!! This Home is so perfect and spacious. We rented the lower condo and can't wait to return! Full kitchen, washer/dryer, the Park is right across the street and the hot springs!!! All seasons fun at it's best. After touring with music groups for over 10 years, this is hands down our favorite rental! Thank you Brandon! Really enjoyed your family and 2 lovely little girls See you again next summer! Located about an hour from Telluride and Silverton. Great central location. Use Ouray as your Base Camp! While vacationing here you will enjoy some of the best scenery Colorado has to offer. Whether skiing, snowboarding hiking or just site seeing you will have plenty to enjoy. The hi country is best seen by jeep or motorbike for the adventuresome, the numerous jeep trails will take you deep into Colorado's historic mining camps where you relive the past. Telluride is only 40 miles distant and offers world class skiing, and great shopping. Silverton is 40 miles distant and offers a historic look at Colorado's mining history. Please note: Rates quoted are seasonal, ***LOWER CONDO. LOWER CONDO is much larger, rents SEPARATELY for $30 more per night than the UPPER CONDO. It has 1 bath with a claw tub shower conbo, and a new large 2nd bath with oversized tiled shower, 4 beds and a sleeper sofa and sleeps 8-10 guests. LOWER condo has a Queen in master bedroom, full size bunk beds second bedroom, 3RD very small bedroom with double bed and Queen sleeper sofa in the living room. QUOTES are emailed to you within 48-72 hours of your request. We welcome your requests. If you rent either condo 5 or more nights the cleaning fee ($150.00)per condo is waived. Cleaning fee may be waived depending on season of booking. If a family or group rents BOTH condos (4 or more nights) for identical time period, then TOTAL for both condos is discounted 15% off rate for BOTH condos. There is also a 3.00 per night lodging tax added to rate. There is ample off street parking for up to 5 vehicles.